FEAR AGENT is the science fiction comic book series that etched Rick Remender’s name in my mind and lured me into reading his stints on Marvel Comics’ THE PUNISHER, UNCANNY X-FORCE, SECRET AVENGERS, and most recently UNCANNY AVENGERS and CAPTAIN AMERICA. But however good – and in many instances, truly brilliant – Remender’s work on these company-owned characters has been, I’ve been hankering for his return to creator-owned work for a long time now; a series where he’s unshackled from the parameters of corporate comics; a series that allows him to unleash his ingenuity. Over the last six months, Image Comics has assuaged me with two new series from Remender: DEADLY CLASS and BLACK SCIENCE. Both are works of stunningly high quality, yet equally, very different kinds of stories operating in distinct genres. DEADLY CLASS (with artistic duo Wesley Craig and Lee Loughridge) focuses on a clandestine high school hidden under the depths of San Francisco. 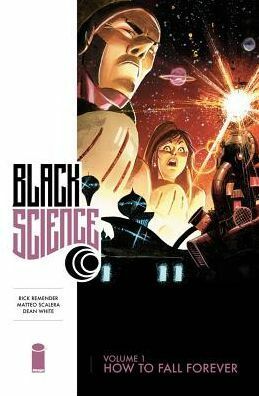 BLACK SCIENCE, meanwhile, while reminiscent of FEAR AGENT in that it’s another science fiction epic, is an examination of a diverse group of characters surviving in the most perilous of circumstances: wrenched through layers of parallel dimensions as they desperately seek a way to return home. This first volume of BLACK SCIENCE, subtitled HOW TO FALL FOREVER, deftly introduces the series’ high-concept and the expansive cast of characters. Grant McKay, a former member of The Anarchistic Order of Scientists has finally achieved his life’s work with the creation of the Pillar, which punches holes through the layers of reality (“the onion”) enabling travel between dimensions. We’re assured McKay and his Anarchist League of Scientists have created this device for honourable reasons: with the ability to travel to parallel worlds they have the ability to locate and solve every problem mankind faces. But a member of McKay’s crew has sabotaged the Pillar, and instead of methodically traveling to new worlds, they are barrelling uncontrollably through the unknown, with indeterminable timespans to survive on each new world before the Pillar’s next launch. Even worse, McKay’s kids have inadvertently accompanied him on this journey while his wife – their mother – is back home. McKay is a wonderfully fallible character, whose blemishes emphasize his humanity. He’s a workaholic, addicted to his field of forbidden science, while his family barely registers as an afterthought – yet he has found time to bed his lab assistant, Rebecca, whom he has promised to leave his wife for. We sympathize with McKay because of his circumstances rather than his persona. Alone, we mightn’t care about his survival, but with the crew relying on McKay’s genius to liberate them from perpetual terror, we root for him. This inaugural story arc (the first 6 issues of the monthly series) demonstrates McKay’s capacity to change, to become a better man if he’s allowed the time to do so – but Remender reveals he’s willing to kill off major characters from the get-go: nobody is safe, so there’s constant tension, and the cliff-hanger left me stunned. Of course, Rememder’s script would matter naught if he wasn’t accompanied by an art team as stellar as Matteo Scalera and Dean White. While some characters look a little too alike, Scalera demonstrates his skill at designing and drawing alternate realities and the creatures that exist within them. Aided by White’s coloring, which has a painterly quality at times, the visuals are truly distinctive. This is an artistic duo that visibly improves as their collaboration endures. BLACK SCIENCE: HOW TO FALL FOREVER is an incredibly strong opening arc for the series, and sets a course for potential greatness. Rick Remender, Matteo Scalera and Dean White pull no punches: this is the sci-fi epic I didn’t realize I wanted, but now can’t imagine life without.